Chennai: In order to operate healthcare centres in Tamil Nadu, the State Government has directed all hospitals and diagnostic units to gain licenses under the Clinical Establishment Act by applying for it on/before 31st March 2019. Following the direction of the government, over 8,000 healthcare units applied in the Health Department of the state for the licenses which would be applied for the next 5 years. An important feature of the rules mentioned the definition and requirements of a “Consulting Room” versus a “Clinic”. As per the rules, for setting up a “Consulting Room”, a doctor would have to have a space of not less than 100 square feet with sufficient light and ventilation. The rules also specify the minimum requirements of staff and equipment such as examination couch, BP apparatus, Stethoscope, Torchlight, Tongue depressor, Thermometer. 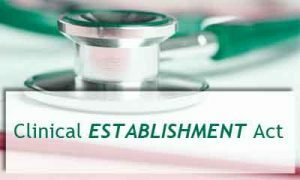 The said rules notified that all public or private healthcare centres starting from consulting rooms, clinics or polyclinics to dispensaries, diagnostic centers, x-ray centers, dentist centers, maternity centres, nursing homes, and hospitals should get themselves registered for licenses under Clinical Establishment Act. The deadline for the application ends on March 31. Any institution failing to apply won’t be able to operate. The Directorate of medical services developed software to register all hospitals under a centralized process. The Director of Medical Services Dr N Rukmani informed the TOI that the department has trained staff at district level to upload data from onto the software before it is officially launched mid-January. These establishments will be inspected by respective district health officials to ensure they fulfil the infrastructure and human resources required. If they qualify, they will be given a licence for five years. The medical professionals associated with Indian Medical Association have welcomed the move. Keeping in mind the specific space requirements that have laid down by the new Act, Many paramedical, laboratory education and welfare associations have asked for relaxations in the norms as they could not apply for the same. He further informed that if the government enforced the regulation with strict deadlines, around 20,000 laboratories will be shut down and over 50,000 technicians would lose their jobs. Any risk of a license Raj scenario..in the future..with its attendant issues..?